Mindfulness teacher, author, and consultant Ananda Leeke's #ThrivingMindfully podcast inspires you to incorporate mindful moments into your daily life. Listen to today's episode that features Ananda reading her original poem, "Our Breath." Her poem was inspired by her experiences at the inaugural silent meditation retreat for mindfulness teachers on September 20-25, 2018, at the Big Bear Retreat Center in Big Bear City, California. She shared the poem during a guided meditation that she led on September 23, 2018. 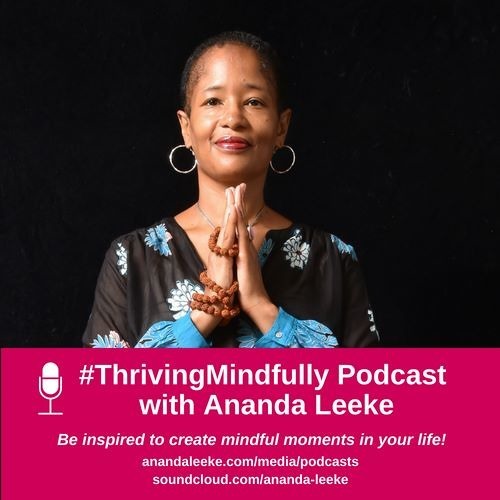 Get a dose of mindful inspiration with the #ThrivingMindfully Podcast Series and Video Series: podcast - @ananda-leeke and video - www.youtube.com/user/anandaleeke. Looking for a mindful online community? Join A Mindful Cup of Tea Facebook group for weekly mindful moments and discussions: www.facebook.com/groups/MindfulCupofTea. If you are in the DC metropolitan area and looking for mindfulness and meditation activities, check out the #ThrivingMindfully Meetup Group: http://meetup.com/thriving-mindfully-meetup. Visit http://anandaleeke.com to learn more about Ananda's #ThrivingMindfully journey as an artist, author, digital strategist, mindfulness and yoga teacher, Reiki master practitioner, and speaker. Contact ananda@anandaleeke.com to learn how you can work with her as an artist, creativity coach, speaker, or trainer. Explore her world through her words and experiences in her books "Love's Troubadours" (yoga-inspired novel), "That Which Awakens Me" (creativity and mindfulness memoir), and "Digital Sisterhood" (tech and mindfulness memoir): http://amazon.com/author/anandaleeke. Lovely! Thank you for being an integral part of this experience - from encouraging me to go forward with the idea back in May to being part of the launch! Much love, sister.